Swim Coach Kindle – Effective Poolside M-learning as in ‘Mobile,’ ‘Micro’ and by the ‘Minute’. On its own content on an e-Reader such as a Kindle is NOT e-learning or m-learning. So how, in the context of swim coaching do I make it so? There are two audiences, the athletes and fellow coaches. I have dual responsibilities, as a coach putting in place ways to improve the times these swimmers produce (coaching) and in workforce development improving the skills of the team teaching or coaching swimmers. The Kindle content can be shown to swimmers; with the right content this has already proved brilliant at SHOWING the swimmers what I want them to do, complementing any demonstrations I do poolside. Getting their eyes and ears engaged on the task is the challenge. The right content, such as the Swim Drills Book has in place bullet pointed learning tips and focus points for the coach so that you can speed read this, or take a tip quite easily at a glance. More micro-learning that mobile-learning. A colleague who was sitting out got her head around the Kindle after a few quick pointers on how to page turn (if we even all it that anymore). She did two things, checked some progressions into swimming Butterfly for her next group of swimmers, taking from this a useful learning tip and then checked something on timing in Breaststroke for HER OWN swimming. Next week, having primed her by email and some grabs on Kindle operation, I will show her how to highlight passsages in the Kindle and add notes. Surely, as other coaches do the same, this will build into an updated, club developed learning resource that more coaches and teachers will buy into because it is OF the club … we can identify, as you can in a Wiki, the contributions being made by people with decades of swimming experience as athletes, Masters champions and highly qualified sports coaches? Formal Amateur Swimming Association (ASA) qualifications, for example Levels 1, 2 & 3 Teaching Aquatics and Levels 1,2 & 3 Coaching Swimming. Develop content in my swim coach blog, that is gradually taking the extensive offline electronic record or blog set to private, that I have now kept for five years. In here I have just about every session I have taken, possibly 1,000 sessions? Encourage, through the formal programme of teaching and coaching that we have closer integration of what we do poolside and in the gym with both these formal and informal learning resources. I’ve already shared ideas with an e-learning colleague in e-learning who did a Kimble e-learning piece in Articulate some weeks ago. We are going to plan out generating our own content, including exploiting the affordances of the Kindle to create a series of ‘Flicker Book’ animations i.e. by controlling the speed at which you ‘page turn’ you generate or pause an animation that shows a specific technique. This might be as simple as how to scull, or long-legged kick for Front Crawl and Back Crawl. Fascinating. My love for swimming and coaching swimming has been rejuventated as every time I am poolside will now be a workshop for learning. Four days ago 17 poolside helpers, assistants, teachers, coaches and principal teachers – a team manager too, attended a traditional ‘Tell and Talk’ point point workshop on Safeguarding Children.’ I was unwell so unable to attend. I would like feedback from this, but something more than some Smiley Faces or boxes ticked. Any suggestions on approaches to Feedback that work without having to hire in consultants? using the Swim Drills Book. Drill as before, landing in the water streamlined position. Coach to position the Woggle at waist height and about 2ft in front. The bigger and faster the arm swing, the more momentum you build for the jump. Knock the Woggle away with a hard swing. Get completely stretched out in the streamline. Keep the head looking forward only. Try diving over a Woggle. Practice diving over a Woggle or through a hoop. Release & dive forward knocking the Woggle out of the way. Knock the Woggle away as hard as you can. Punch a clean entry in the water. Get into the streamlined position before you enter the water. 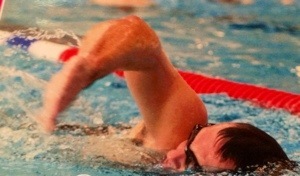 Practice diving over a Woggle. Punch a clean entry into the water. This is the fastest part of the race. The fastest part of the race is when you travel through the air. The second fastest part of the start is the streamlined entry into the water. See how far you can glide. 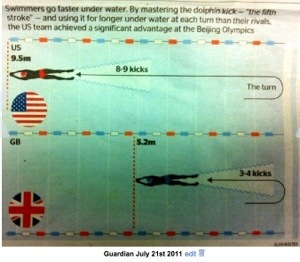 Have a contest to see who can go farthest in a streamline off the start.